The late summer and early fall is apple picking time at the u-pick apple farms and pumpkin patches surrounding the city of Seattle. Did you know that Washington State is the country’s Apple Capital? It’s true, the state produces over a hundred million bushels of apples annually and, of course, is well known for its cherries as well. 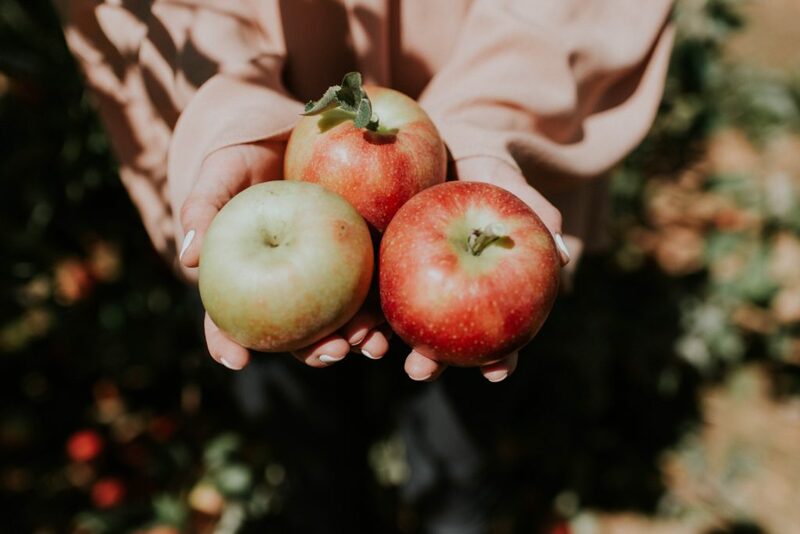 The best apple picking around the Seattle metropolitan area is in King, Kitsap, and Snohomish counties. So whether you are looking to pick fruit, go on a hayride, or buy fresh baked goods, Family Travel Forum has you covered. Before you shell out $20 for an empty bushel bag or up to $5 per pound, keep in mind that different varieties are better suited for different purposes. Honeycrisp, Idared, Red Delicious, Fuji, Macintosh, Empire, and the Jonathon are great for eating. For sauces or pies, use the Cortland, Mutsu, Golden Delicious or Russet instead. If lavender appeals more, this new crop is also plentiful at many of these farms. For a complete guide to apple picking orchards and farms across the country, check out the FTF Guide to Top U-Pick Farms in the US. There are several apple orchards and pumpkin patches located in Seattle’s surrounding counties. Skipley Farm, just a half-hour’s drive north in Snohomish, is one of the more interesting ones, because it offers guided farm tours led by naturalists as well as horticultural classes. A working farm and nursery, they feature “non-certified” organic produce and apples, so at least they’re trying. Among their 2,00 dwarf apple trees, there are 280 varieties, making it a fun U-Pick destination with smaller children. Depending on the season, there are also many other fruits and berries to harvest. September is the best month for choice, but some species are available to pick in August and through mid-October. Need an inexpensive rental car for apple picking? The Farm at Swan’s Trail is a much livelier option in Snohomish, with tons to do. Check out the 12-acre corn maze, early bird breakfast for weekend arrivals and an acre of U-pick big Jonagold and Honeycrisp apples. While some activities carry a premium, they run a petting zoo, duck races, wagon rides and a Four Little Pigs show daily, free of charge. Will you drive two hours to Whatcom County, just outside Bellingham? If so, then Bellewood Acres is the farm of choice, with more than 25,000 trees of 15 varieties under cultivation. During late August through early November, families can board their train and peruse which part of the extensive orchards they want to pick first. At other seasons (this place hums all year round), there’s a huge pumpkin patch, snacking or shopping in their extensive store packed with sweets, fruit, jams and cafe items. There’s a distillery on site with tastings, a gallery of local arts and plenty of family events. Check their online calendar for live music performances on summer weekends and Christmas displays on December weekends. Although Yakima is not very close (allow 2 1/2 hours for the 150-mile drive), we want to shout out to Johnson Orchards, where fruit is in season almost all year. Visit USA Today‘s pick as a ‘top 10 apple picking spot’ for cherries from mid-June to late July. You and the kids can get your hands stained by the Bing, Rainier, Van, Lapin, Skeena and Sweetheart varieties. Come back in August for apricots, peaches or nectarines, as well as pluots, plums and pears. As for apples, they’ve raised apple orchards there since 1904 and the best harvest is September to December. In addition to the many varietals in a state that produces half the apples sold in the U.S., you can enjoy Johnson’s beautiful rolling hills, changing leaves, extensive bakery items and classic ca. 1916 apple warehouse. Closed Sundays. Don’t Forget Washington State Pumpkins! There are many purely-pumpkin patches in Seattle’s surrounding counties. Carleton Farm, about a half hour away from Seattle, promises pumpkins by the thousands in addition to their other vegetables. Enjoy a seasonal Farm Market and free hayrides on a real John Deere tractor out to the pumpkin patches during weekends in October. After you find your choice pumpkins, have fun with the pumpkin cannon, exactly what it sounds like. Brave kids can hang out for the Fright Maze and other haunts, but note that some play areas, such as the zip line, paintball, Kids Pony Express Bucket Train and four-acre corn maze, have a fee. Find the best deals on Washington hotels for your apple-picking adventures here. Remlinger Farms is home to the northwest’s largest Pumpkin Harvest Festival, which runs weekends from late September to the end of October for avid U-pickers. They also have a very commercial Family Fun Park with over 25 kid-friendly rides and attractions. Admission to the Fun Park (open mid-May to late October) includes pony rides, a 4H Animal Barnyard, authentic half-sized steam train rides, and more. Inquire about the self-guided tours which take you around the farm animals too. Visit the farm’s Facebook page or website for more detailed information on seasonal celebrations such as their Beer and Wine Tastings. Their U-Pick offering is limited to raspberry and strawberry weekends in spring. In addition to its pumpkin patches, the Carpinito Brothers Farm, which grows tomatoes and other vegetables and sells produce from farms around the state, invites families to get lost in their corn maze, open through the end of October. Enjoy your day out and share your favorite apple recipes! Can anyone tell me where I can buy golden russet apples.